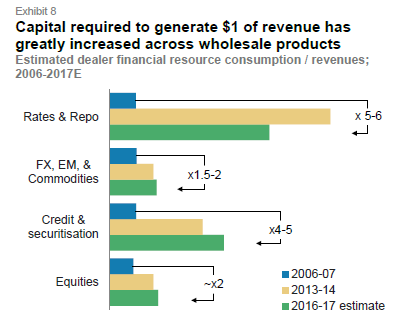 According to an excellent new report from Oliver Wyman and Morgan Stanley (which is well worth reading), financial regulation and QE are at the heart of a huge shift in liquidity risk from banks to the buy-side, which is increasingly a concern for policy makers. The shift is far from over, liquidity in sell-side markets set to deteriorate further, as regulation shrinks banks’ capacity another 10-15% over the next two years. Regulatory risks are rising for asset managers, as policy makers worry about the risks to financial stability from US QE exit and market structure changes. For the banks, diminishing returns on capital from market making demand even greater efficiency, dexterity and scale to achieve 10-12% returns. There is a liquidity conundrum in fixed income markets facing policy makers and investors: how it’s resolved will have long-term investment implications across banks, asset managers and infrastructure players. 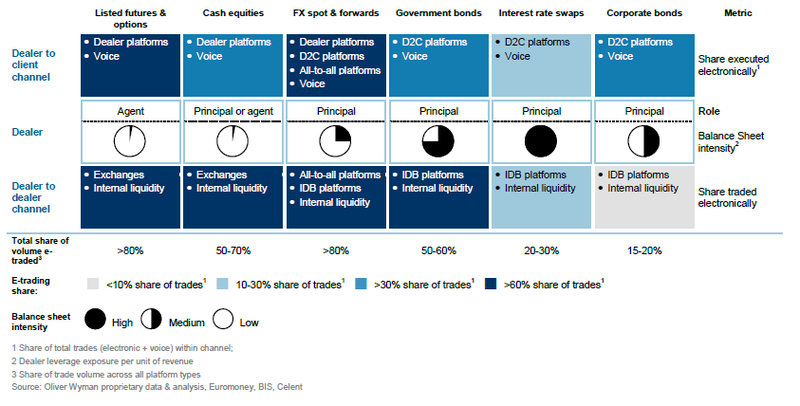 Huge shift in liquidity risks to the buy-side as the twin forces of financial regulation and QE have played out. 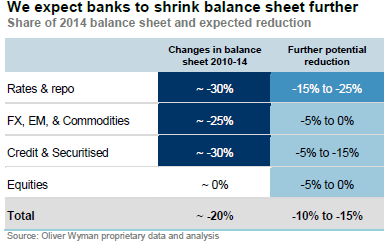 Severe reduction in sell-side balance sheet and banks’ liquidity provision. Balance sheets supporting traded markets have decreased by 40% in risk weighted assets (RWA) terms and 20% in total balance sheet since 2010. Liquidity of secondary fixed income markets is likely to get materially worse. Credit markets are the biggest challenge. Unresolved conflict in regulator desires to reduce the disconnectedness between banks to ensure that asset managers have sufficient liquidity to deliver on promises to their investors, and to preserve companies’ flexibility to issue in a wide range of markets. 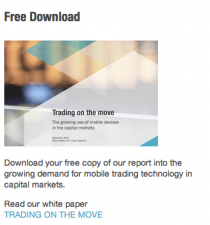 Electronic trading and new marketplaces will grow – but will not solve the fundamental issues. New initiatives to increase electronic trading, new data networks, new agency execution models new marketplaces. However heterogeneity of products will limit how far electronification will go in fixed income markets.